Decorating my living room for Halloween is one of my favourite things to do. When I think of Halloween the colours that instantly come to mind are black and orange. 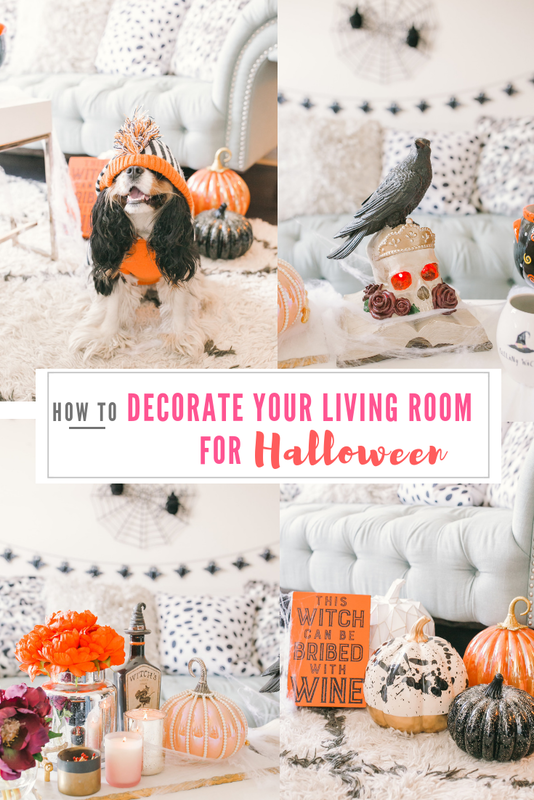 Although the colours can be a bit tacky if done the right way, your Halloween living room decor can be very tastefully spooktacular. 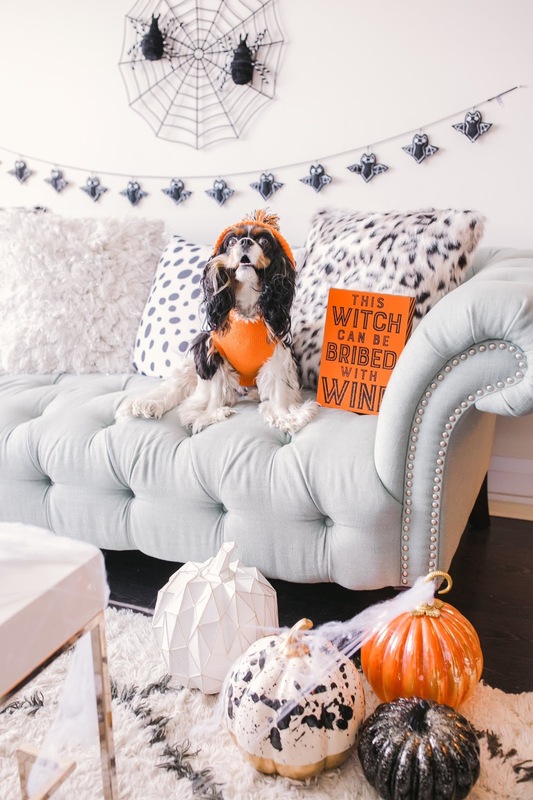 To decorate our living room for Halloween, I picked up some cute items from HomeSense. I wanted to keep the decor theme traditional by having a black and orange palette, but also modern to match our personal style. 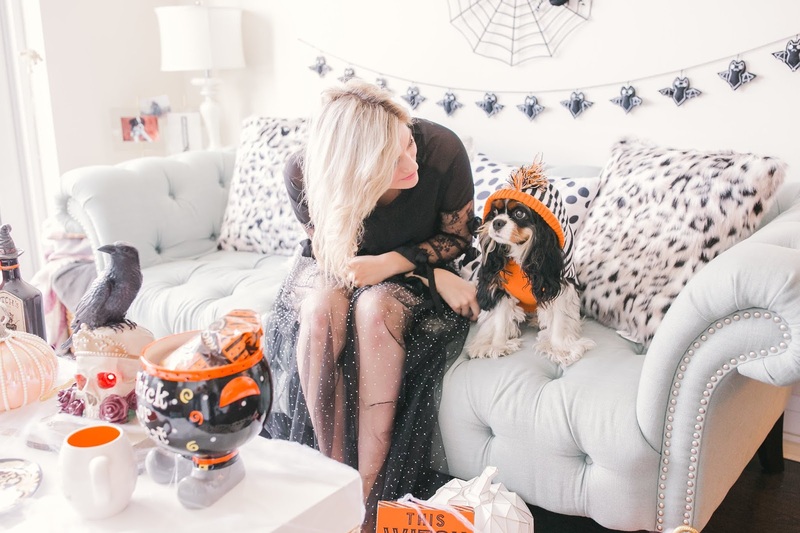 Here are my tips how to decorate your living room for Halloween and pulling together a modern spooky look. 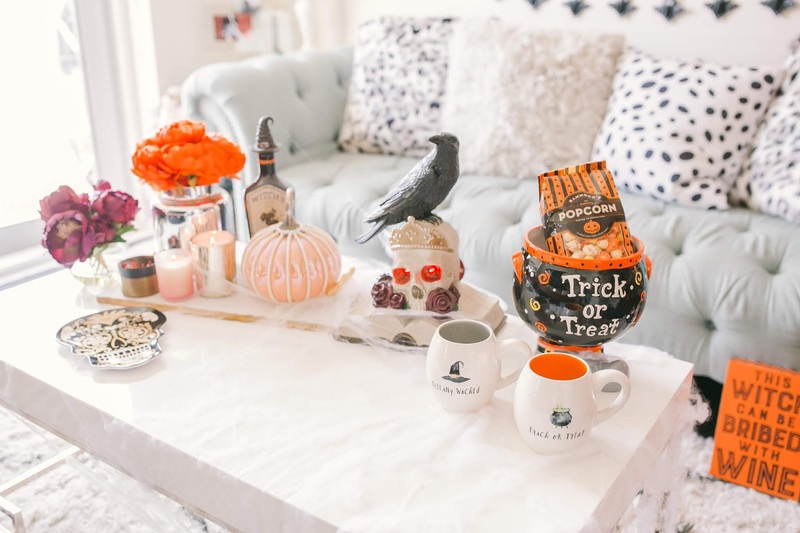 Decorating your coffee table will instantly set the mood for a spooktacular Halloween decor. 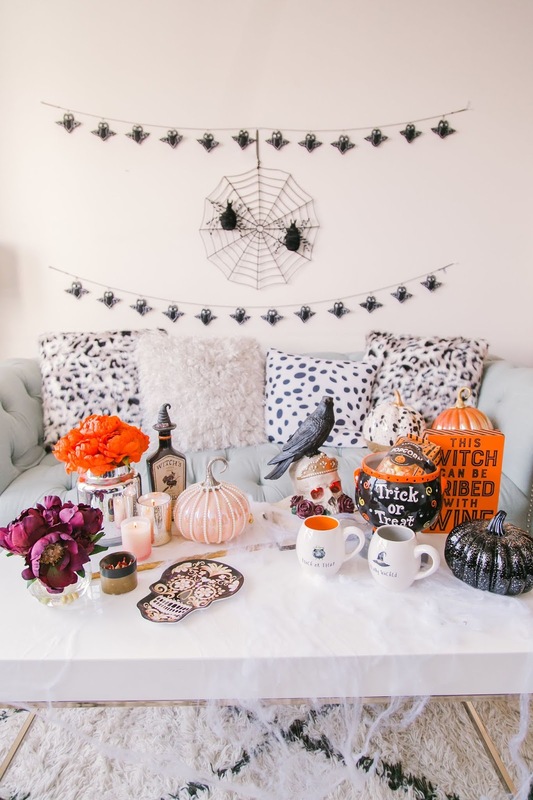 To achieve a modern look I mixed Halloween living room decor together with everyday living room decor accents. 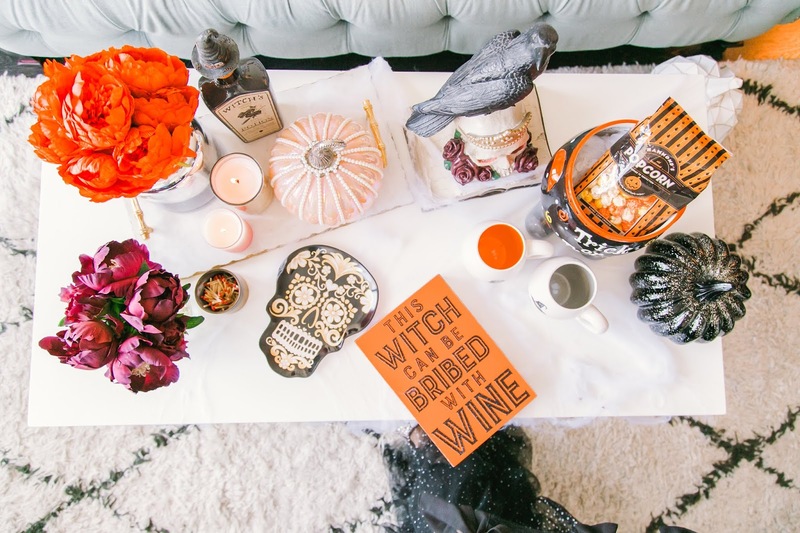 Candles are not only a decor essential they are also perfect for setting a spooky vibe. 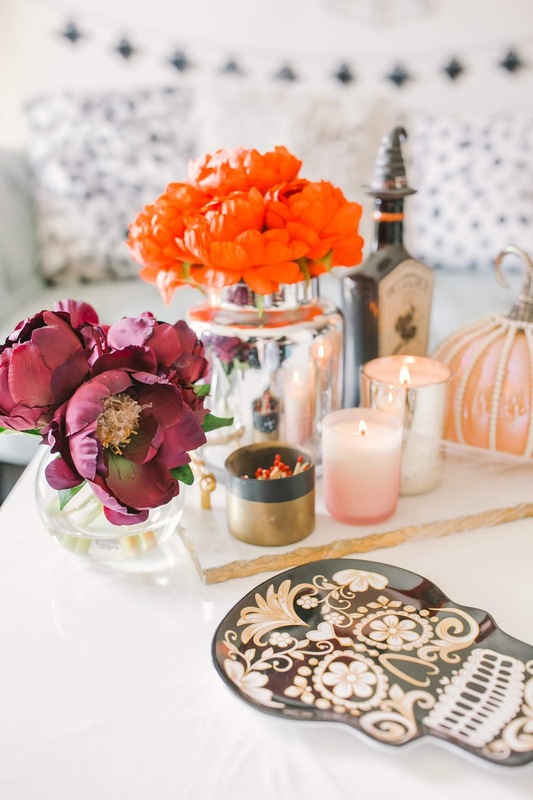 I also added beautiful silver metallic vases with flowers to match my orange colour palette, along with a skull shaped plate, and of course a skull as the centerpiece that also lights up. 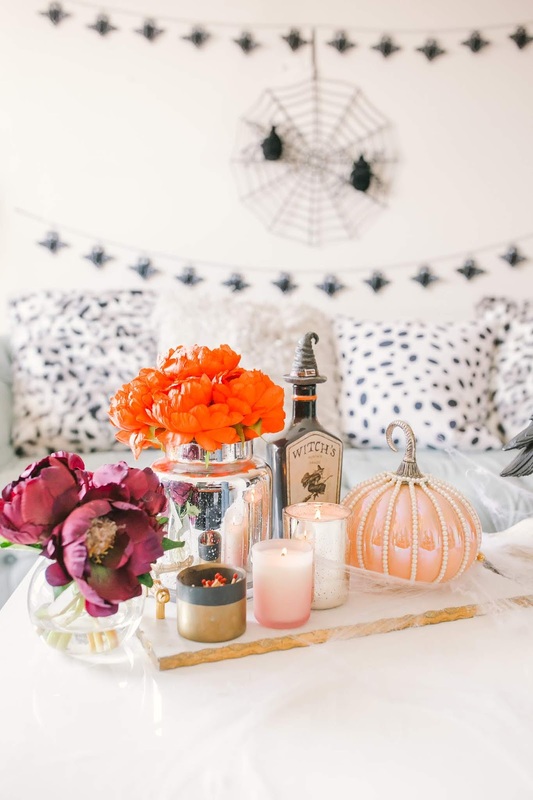 When it comes to decorating your living room for Halloween, pumpkins are an essential. I wanted my pumpkin choices to be modern and mess free, so I picked up these beautiful coloured glass pumpkins instead. Not wanting to deal with carving out pumpkins and making them pretty by spending hours on a DIY project, I thought about my colour palette and picked up these fun pumpkins from HomeSense for a very reasonable as well. 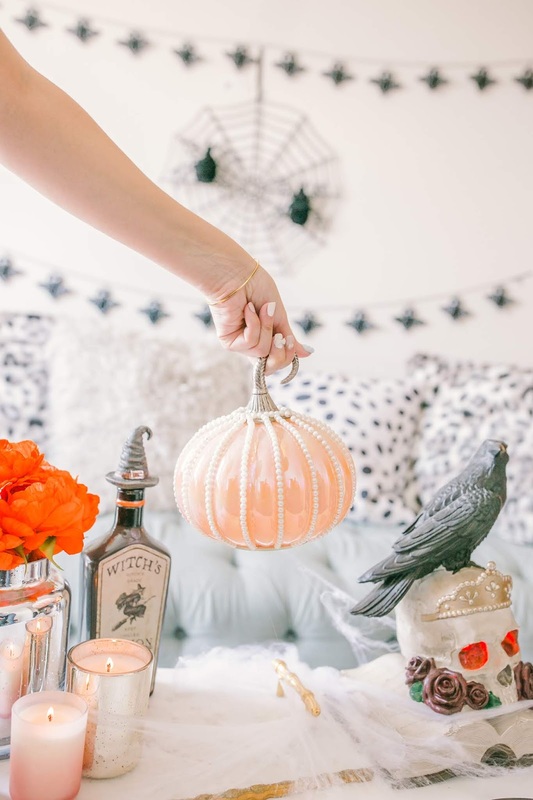 I love the details of all of the pumpkins, from the splatter to the pearl detailing glass pumpking, these are so fun and modern. Jack O’ Lanterns are beautiful, but I prefer them for the outdoors. Make things more interesting with a creative living room wall decor display. 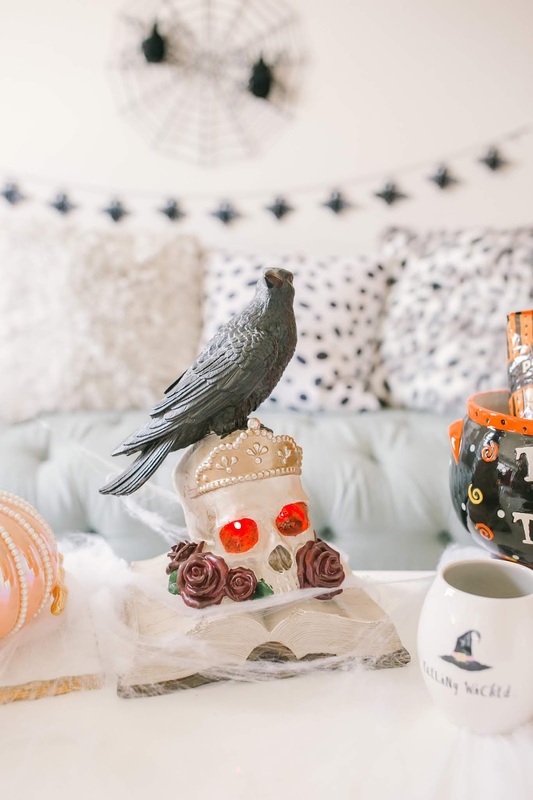 Your wall decor is as important for creating the perfect feel for your Halloween modern decor. 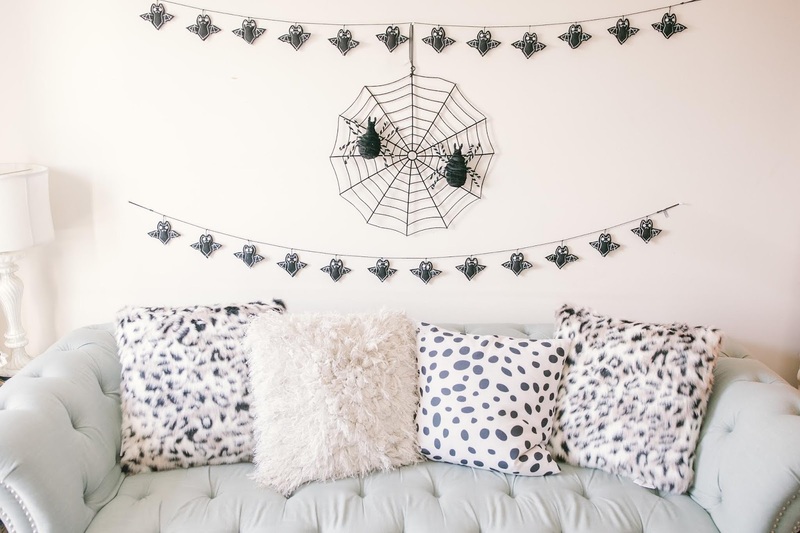 To create a modern but spooky Halloween wall décor I went with a focal piece of a large velvet spider web and then I added a bat garland above and below it. 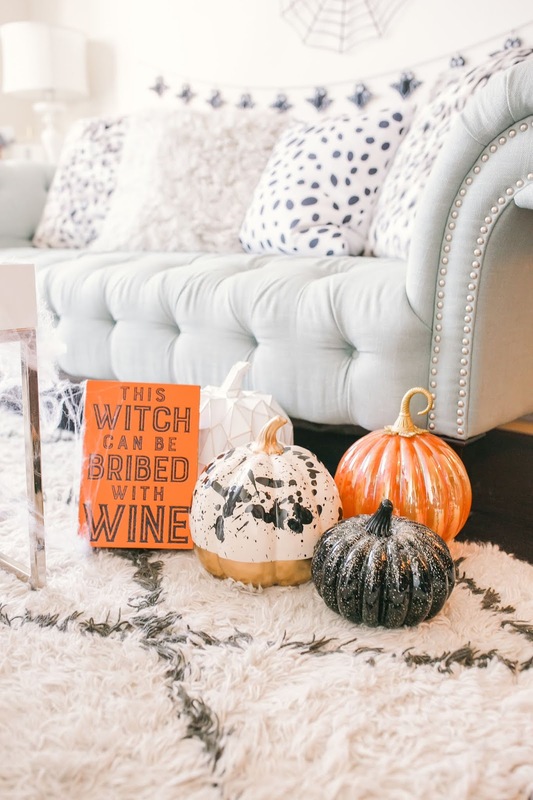 Throw pillows are the final touch for putting together the perfect modern Halloween living room decor. 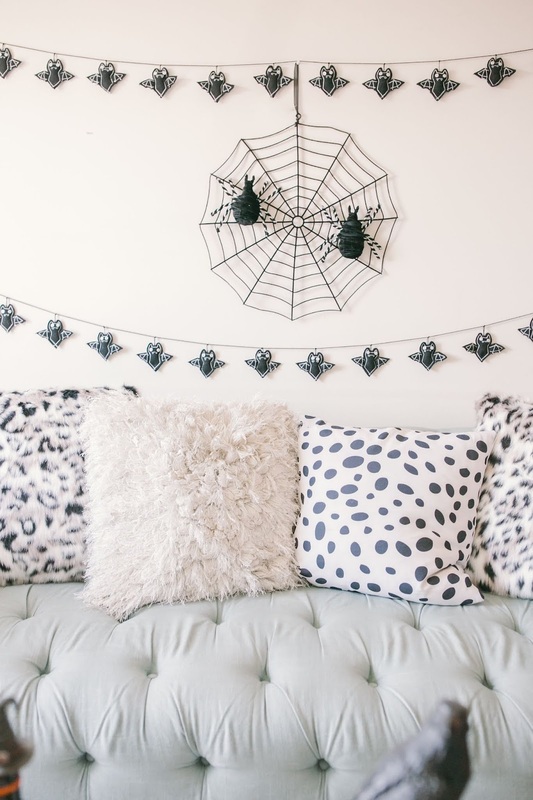 Since I already added tons of Halloween related accents to the rest of the room, when it came to the throw pillows I went with a leopard black and white print so that the room does not become overwhelming with Halloween themed items. 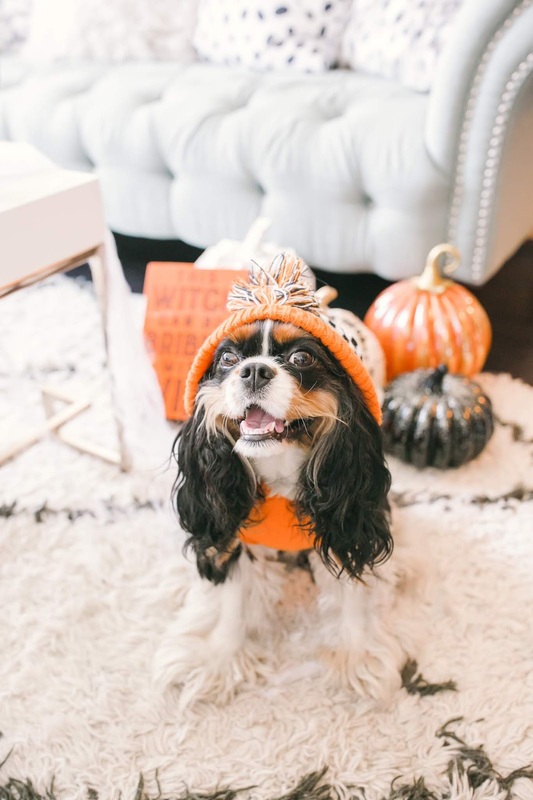 I could not help but dress up Margot or Halloween. 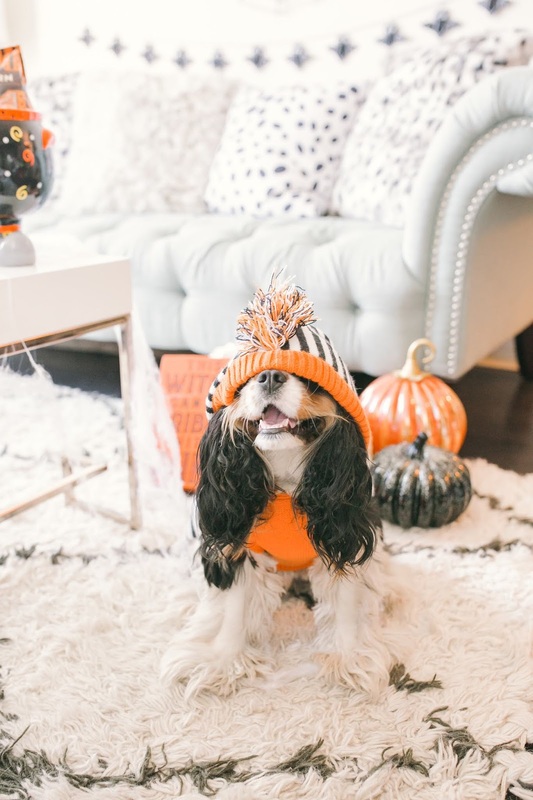 She looks adorable in the little black and orange sweater I picked up from HomeSense. 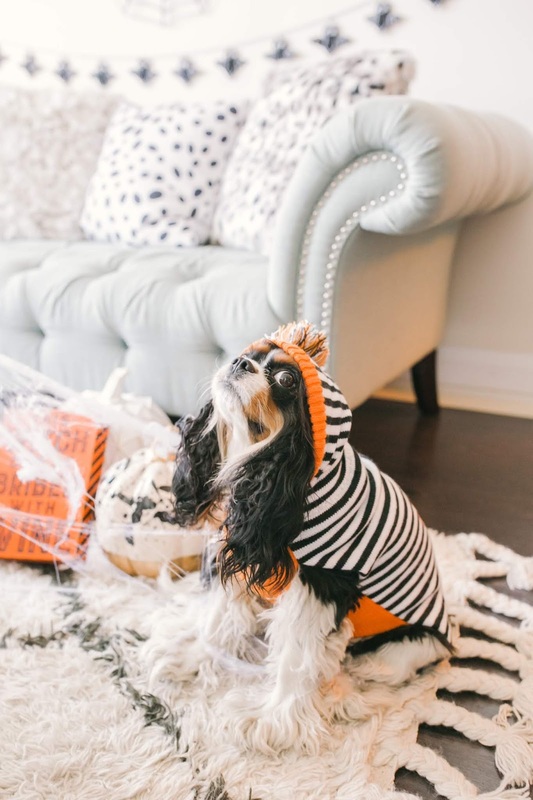 There are tons of options in store, depending on your pet’s size as well what you want to dress them up as. Those are my tips how to decorate your living room for Halloween. Although I went for the traditional, orange and black colour palette, you don’t have to. 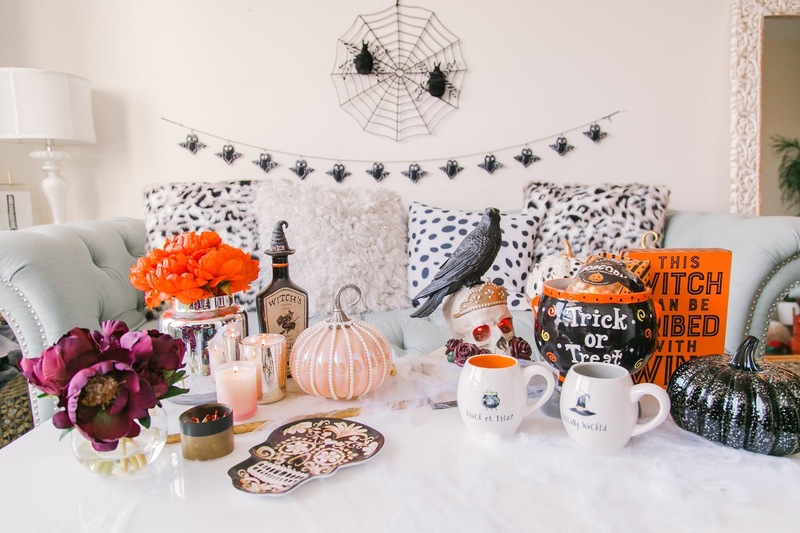 You can have lots of fun with creating a spooktacular mood for Halloween. 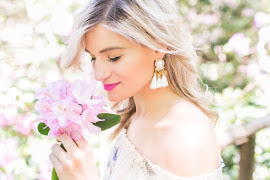 I grabbed all of our decor items from HomeSense, and they have lots of options whether you want to go traditional or more modern. 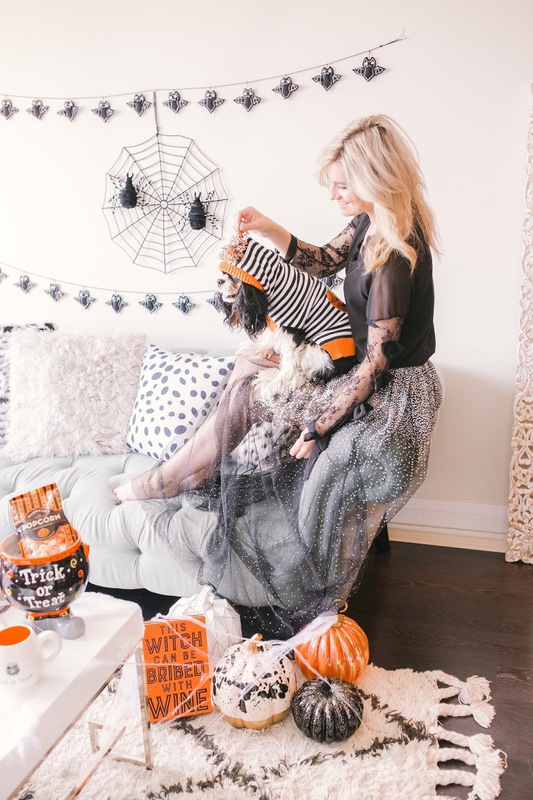 Will you be decorating for Halloween?